At Shula’s Steak House, enjoy great food at the critic’s choice of Orlando’s Best High-End Steak House. Each restaurant is themed after the 1972 Miami Dolphins’ “Perfect Season” – the only team in NFL history to finish a season undefeated. The menus are hand painted on an official NFL game football. 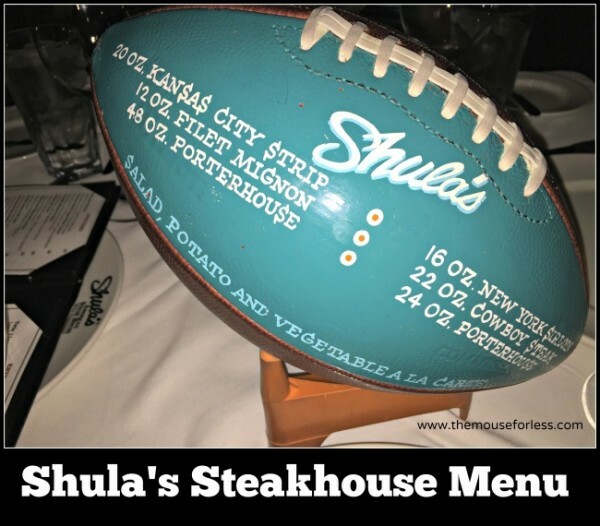 At Shula’s Steak Houses, one of the featured entrees is the 48-Ounce Porterhouse. Those who finish it join Shula’s 48-Ounce Club, which currently has more than 26,000 members.